The shop is full of new yarns, notions, bags, books and gift items and even more new items are arriving daily. Some of the newest yarns are Plymouth's Juli, Baby Alpaca, Deaire, Baby Alpaca Grande and Knit Col as well as Berroco's Lacey Yarn. 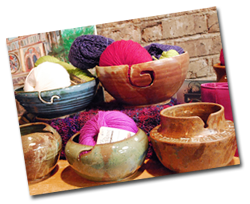 One of our new favorite finds is pottery yarn bowls hand-crafted by local artisans. You've got to see them yourself to see just how beautiful they are ~ what a great gift for the fiber artist in your life!